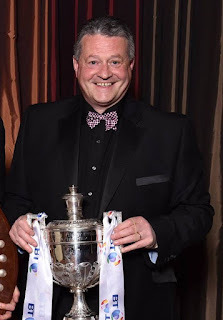 Billy McHarg is to continue in his role as club President after the end of the season. Although originally announced he would step down due to skepticism over the Super Six, he has agreed to stay on after being asked by his committee. Speaking exclusively to Ayrrugbyclub.co.uk, McHarg stated: "At first I was unsure of the clubs future but over recent developments in the past couple of months I'm as confident as ever and looking forward to what lies ahead. We have a clear goal and I'm confident in placing the right people around me in order for the club to succeed. "The development's in the Super Six have been a key factor in my decision". The announcement comes days before Ayr's BT Premiership Final with Melrose, where they aim to become back-to-back champions. Tickets for the supporters bus to Melrose are still available via our Bar Manager Colin. Phone 01292 441 944 for more information.